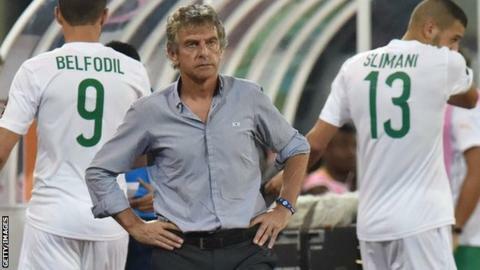 Algeria coach Christian Gourcuff has been given a new deal despite the Deserts Foxes' quarter-final exit at the Africa Cup of Nations. The Frenchman, who was appointed in August 2014, was unable to steer Africa's stop-ranked side past Ivory Coast, losing 3-1 on Sunday. But Algerian Football Federation president Mohamed Raouraoua "has renewed his confidence" in Gourcuff. "There will be changes within The Greens," said Gourcuff. "Some players are entering their 30s and are preparing to leave the team. We'll have to call up other younger players. "We already have a core of young and good players around which the future national team will be built. "We'll only need to reinforce certain areas by other elements for upcoming deadlines, notably the 2017 Africa Cup of Nations and the 2018 World Cup." Algeria captain Madjid Bougherra had already announced he would retire after the tournament in Equatorial Guinea.